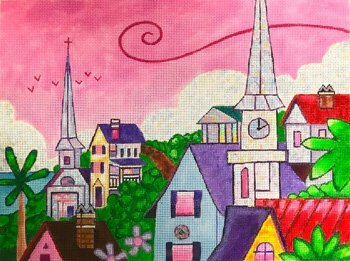 Holy City Roof Tops needlepoint is a whimsical design by American artist Tate Nation which depicts a town skyline with pink sky. It is offered by Purple Palm designs. This needlepoint canvas measures 9" x 12". The Holy City Roof Tops design is handpainted onto 18 mesh mono needlepoint canvas. If you have lots of stash, Holy City Roof Tops is perfect for a partial stash buster. Use your stash for the buildings and contact us to kit the pink sky. We recommend you use stretcher bars to hold the canvas taut. We recommend a pair of 13" and a pair of 16" stretcher bars and some thumb tacks.